Prominent & Leading Manufacturer from Mumbai, we offer high pressure pump. We are the manufacturers of High Pressure Pump. 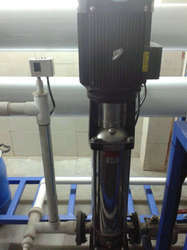 We utilizes the best available HP pumps and mostly uses grundfoss Pumps. The life expectancies are for pumps when used with our systems are far better than others. We installs the most efficient pumps available for the capacity of system being built. Since electrical costs account for most of the cost of ownership of a system, any improvement in efficiency is significant. Any reduction of efficiency as may be found in competing systems can cost far more than the price of the system over time. Together with the customer we will openly evaluate the advantages and disadvantages of each choice and select the pump type that will prove most advantageous for the customer for the long term. Looking for Pumps and Dosing Systems ?